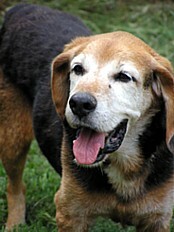 A very special and courageous Beagle has recently passed to the Rainbow Bridge. Please join us in paying tribute to Jayhawk, a Katrina dog who was saved by the U.S. Coast Guard and rescued, fostered and loved by Cindy and Gary Peterson of Hokie's Hounds Beagle Rescue in Prairieville, Louisiana. "Jayhawk came to us post-Katrina, on September 29, 2005. He was rescued by the Coast Guard and was living on the base until he had to find another place to go. 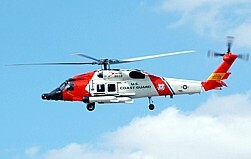 He was named for the Coast Guard Jayhawk helicopter which was used in Katrina rescues. A lady heard about Jayhawk's plight and brought him to Baton Rouge. 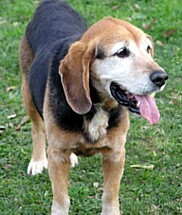 She had him vaccinated, and called Hokie's Hounds Beagle Rescue. We took him in, had him neutered, and treated him for heartworms. 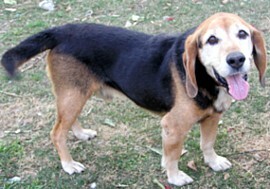 We posted his information on Petfinder's Katrina rescue board. since they had no place to stay themselves. They surrendered him to Hokie's Hounds. sleeping in the same spot in the yard, in order to be at the ready should he be needed. Most of the time we called Jayhawk by his other name, "Semper Paratus" (Always Ready- the Coast Guard motto and service song). Jayhawk was a proud boy. One of our favorite memories of him was when Gary would sit at the computer and Jayhawk would sit on his lap, paws "conducting" while the (Coast Guard) anthem played. Our boy passed away on Christmas Day due to acute necrotizing Pancreatitis. The vet said that this type of Pancreatitis moves very quickly and is "unforgiving", but he felt that it was good that he was at the clinic and that he did not suffer. He'll be sorely missed."